Like many parents, Rick Pescovitz from Ohio, has spent countless hours attending his kids’ outdoor events over the years with the unexpected weather experience. That finally led him to come up with the idea Under the Weather. Let’s see whether he took the opportunity to gain a deal from the Sharks with the proposal of $600,000 for 10% equity in the company! Under The Weather has revolutionized the outdoor spectator experience. Have you ever had bad experience with the different seasons while enjoying outdoor events? Was it terrible? Rick brought to Shark Tank the real experience of suffering the rain and the wind in fall soccer as well as your body starting shaking and frozen in the winter games. The Under the Weather sports pod weighs less than 7 pounds, pops up and folds down in seconds. Also, it is treated with a coating preventing the harmful rays of the Sun. It has three transparent sides so that you cannot miss the match. Besides, there is a connecting version with the wall in between. The water roof and wind blocking properties inherent in fabrics are able to help increase the ambient temperature inside the pod by as much as 35 degrees warmer than outside. Robert admits even though it looks ridiculous and people seem to be in jail, it obviously works. Lori, however, thinks it is a little bit difficult to look through plastic. Kevin quickly entered the conversation asking Rick about the sales and his forecast. According to the entrepreneur, 85% sales have been made online and the retail price is at $99.99 a piece. He added that the cost is at $23 with 75% margin. Last year, he sold 22,000 units which brought him $2 million dollars. In total, he has 9 design patents, in which the adjoining ones are pending for utility patent. Rick first started a company in embroidered apparel and promotional items with $8 million. However, he sold it in 2012 for $3.5 million due to the fact that he hated the business. Admittedly, Rick loves wearing what he wants every day, does not want to sit behind the desk and definitely loves money as well. Rick invested his savings in this new enterprise while his wife, Kelly who got involved, used her 25 years of marketing experience to rapidly grow the brand on social media. After Rick’s interesting presentation and full of passionate pitch, the sharks were biting. Daymond was the first one to offer his opinion about the distribution. He thinks Rick should keep online for himself and license the retail. Therefore, he made a deal of $600,000 for 20% stake. Followed by, Kevin matched Daymond’s offer at $600,000 in exchange for 20% equity with a piece of advice that the entrepreneur should pay attention to the management system of inventory and accounting. Robert took time to say that he did not think Rick needed a hand with the investment because he was doing a great job. As a result, he backed out of the deal. Coming back into the offer’s table, although Rick already had 2 offers made, he was looking for Mark’s. Fortunately, Mark was definitely interested in the idea. He then mentioned about SEO and advertising for Under the Weather. Eventually, Mark offered $600,000 for 15% equity with the option to buy 10% for $600,000, which is open for 12 months. Multiple sharks were interested but the deal ultimately went to Mark Cuban who offered $600,000 for a 15% stake in the company. What happened to Under the Weather after Shark Tank? 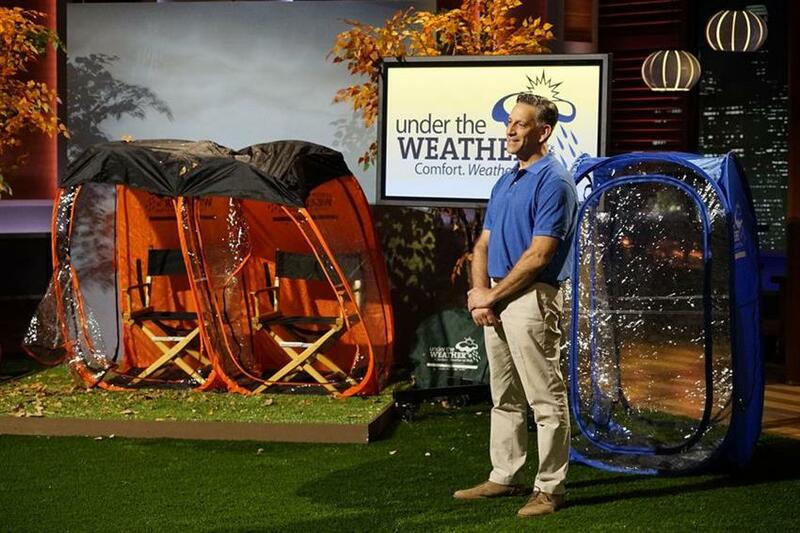 The Under The Weather pop-up tent offer a 270-degree viewing (front view and two side views). It is super light-weight, both wind and water resistant. It has fully enclosable zips inside and out and can accommodate two people at any outdoor sporting events. By using this tent, you are protected from sun light, rain, wind, and snow while watching outdoor sports. It takes only 20 seconds to set up and 40 seconds to fold out. You can easily carry it to anywhere you like.